Despite my mention of it in one of last month's Bits & Bites, a number of readers contacted me with news that Abercrombie & Fitch has closed its store at Lenox Square. Yes, the store has closed, but no, it is not permanent. 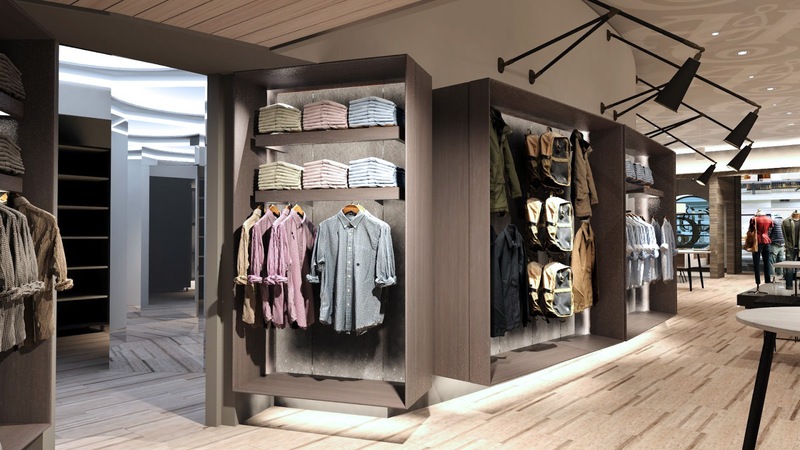 The store will be one of only seven Abercrombie stores nationwide to undergo an extensive remodel that will introduce the latest evolution of the once trendy retailer. The first of the new stores is scheduled to debut February 17th at Polaris Fashion Mall in Abercrombie's home market of Columbus, Ohio. The new store design was about a year in the making and is described as "warm, inviting, open and inclusive" (kinda like America once was.) “This store is so different from what we delivered in the past. It’s really a complete overhaul,” Stacia Andersen, brand president of Abercrombie & Fitch and Abercrombie Kids, said in an exclusive interview with Women's Wear Daily (WWD). Most important for many older customers, or parents of younger customers, or really anyone who cares about their ears, "the music has been toned down." About $2 million will be spent to renovate the store with it slated to reopen later this summer. Last year Abercrombie spent upwards of $330,000 to renovate their Hollister store at Lenox Square. A new Chicken Salad Chick is planned for the new North Lake Square shopping center on Dawsonville Highway in Gainesville. The new restaurant joins Chipotle Mexican Grill, Pollo Tropical and anchors Academy Sports + Outdoors, Burlington, HomeGoods and Hobby Lobby in the center. The Boxer Property office park at 2295 Parklake Drive in unincorporated DeKalb County was recently annexed into the City of Tucker. Following the recent closure of the SuperTarget (and soon Rack Room Shoes) on Holcomb Bridge Road in Roswell, one ToNeTo Atlanta reader indicates IKEA may be in talks to take over the property for a new store. The popular Swedish home-furnishings retailer opened their Atlanta store at Atlantic Station in 2005, but has been adding additional stores in the southeast in recent years. While a second store in Georgia might do well, I'm concerned about whether the Roswell site is large enough or in the right location for an IKEA. A building permit filed with the City of Atlanta indicates that Amazon intends to open a second "pop-up" kiosk in metro Atlanta. With one kiosk already open at North Point Mall, the second store, which the permit indicates would be roughly 300 square feet, would open at Lenox Square in Buckhead. The store will likely sell Amazon branded products like the Fire, Echo and Kindle. Indianapolis based hhgregg, a retailer of consumer electronics and home appliances, is at risk of being de-listed by the New York Stock Exchange (NYSE). The company, which trades under the ticker HGG, has seen its stock price plummet in recent months, today hovering around 40 cents or so. After hitting $20.11 on September 20th, 2013, the stock has never returned to that point and has been on a downward spiral since. In order to be in compliance with NYSE rules and regulations, the stock must return to a per share price in excess of $1 and have its market capitalization, currently at just over $10 million, be above $50 million. The company reportedly intends to submit a plan to the NYSE within the next 45 days outlining the actions the company will take to comply. The retailer recently reported disappointing sales for the fiscal third quarter, which ended Dec. 31, of $453 million, down nearly 24 percent from the same quarter a year earlier. As a result, the company announced a restructuring plan that will eliminate 100 jobs, including 70 at its Indianapolis headquarters. The plan is expected to save the company $15 million annually. No store closings were announced as part of the restructuring. Currently, the company operates 220 stores in 19 states. Hhgregg operates a dozen stores in the greater metro Atlanta area including locations in Buckhead, Smyrna and Alpharetta. Atlanta's newest Bonefish Grill opened this past Monday at Akers Mill Square on Cobb Parkway. The newly built restaurant, part of Tampa-based Bloomin' Brands, is open for lunch and dinner, and Sunday brunch. Bonefish will soon be joined by Chuy's, a Tex-Mex eatery, expected to open in the coming weeks in a portion of the former Circuit City and a rebuilt Chick-fil-A, with inside seating, expected to open in May. Aldi will officially open two new stores in metro Atlanta tomorrow. The new grocery stores are located in Northlake Square in Tucker and Peachtree Corners Marketplace in Peachtree Corners. Each store is about 18,000 square feet and will debut the chain's newest design elements. Local residents are invited to take part in Grand Opening events at both locations which will include product samples and the opportunity to win gift cards and free produce for a year. Well placed sources now confirm that Fifth Group's Ecco restaurant, planned for Phipps Plaza near the AC Hotel, has been delayed. Once planned to debut this summer, but later pushed to the fall, it is now targeting a "2018" opening. 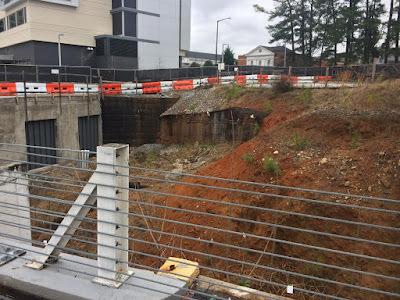 Fifth Group reportedly had to "regroup" after identifying substantial work that needs to be done to prep the hole in which their multi-level restaurant will be built. Kennesaw will get a second Del Taco restaurant later this spring when a new location opens at Kennesaw Marketplace. The quick-serve Mexican chain already has a location at Madison Place at Chastain on Chastain Road but will be targeting the Town Center and Cobb Parkway market with their new location. "The new store design was about a year in the making and is described as "warm, inviting, open and inclusive" (kinda like America once was.)" First Watch is coming to Decatur Crossing and the development's Sprouts is scheduled to open March 1. The Ikeda idea is absolutely absurd. They would break every real Estate requirement they've ever had. Size of parcel, interstate frontage or access etc. I live very near the closed Target and don't see any possible way an IKEA could work in that location. At the very least, there is no way could Holcomb Bridge Road support that kind of traffic. I hope A&F will also tone down that gawdawful perfume they pipe through their HVAC. You san smell it across the mall. I'd love to have an IKEA there in Roswell; I could almost walk to it from my house. But I agree that the site doesn't seem right for what IKEA looks for. I'm hardly surprised that hhgregg is struggling. The one time I shopped there for appliances, they messed up both appliances that I bought, and not just a little bit. Considering the level of arguing that I had to go through to get it fixed, I've never stepped foot in their store again. I wish IKEA would open in Gwinnett County. Sales taxes are much higher in the City of Atlanta and Fulton County than in Gwinnett. @Anon on 2/9/17 @ 6:03PM - If you're going to let a 2% difference (vs Atlanta) or 1% difference (vs. Fulton) prevent you from buying cheap particle board furniture, then you probably don't need to be spending money on furniture at all. Agree with Anon on February 10, 2017 @ 8:16 AM. I live in Gwinnett County and their customer base does not even reside here. "If you build it they will come" is on the customer not the retailer. please leave your political views out of your articles....you sound like a sore losing lib! It's his blog. He can post what he wants to. You can go elsewhere. Btw, Clinton technically won. You sound like a radical Repub or a Trumped troglodyte. Na-na na-na boo-boo! Seriously, his comments are interesting, germane, insightful, and appropriate on many levels.